NYC event on trade union movement in the Philippines | Fight Back! 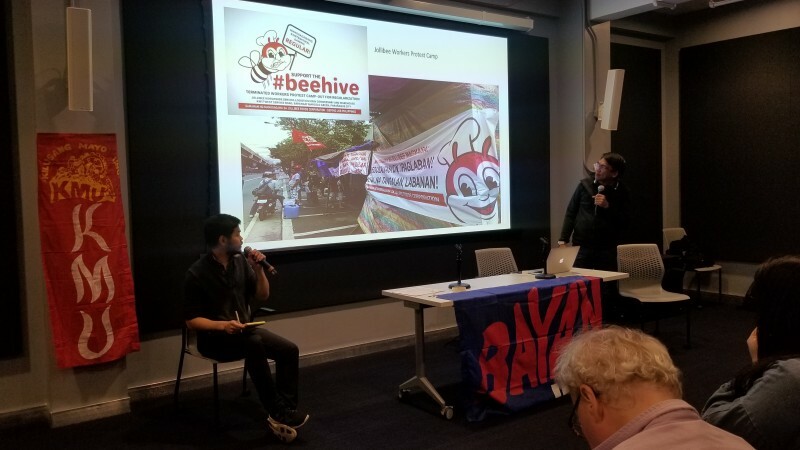 New York, NY - Forty activists gathered on Friday, April 12, at The People’s Forum in New York City for an event on the Philippines labor movement hosted by BAYAN USA and Mission to End Modern Day Slavery. The program, titled, “Breaking the Chains: A Sharing on the Philippines Labor Movement,” featured presentations by Kilusang Mayo Uno (May First Movement) Vice Chair Ed Cubelo, and BAYAN Metro Manila Chair Mong Palatino. Ed Cubelo’s presentation focused on the current situation of Filipino workers under Duterte’s regime. Cubelo explained that while Duterte boasts about job creation, workers still face a low minimum wage of $10 per day in the capital region, and $3 to $4 per day in some regions of Mindanao. 70% of workers are also still contractual, meaning they are temp workers who cannot legally join unions and receive no benefits or health care protection. Cubelo focused the bulk of his presentation on workers’ resistance and success in organizing unions and strikes. A few examples from 2018 include workers at Jolly Bee and PLDT who, after organizing with the May First Movement (KMU), were able to found unions within just one week. Workers at Middleby organized a sit-down strike that continued even as the government attempted to starve them. Despite increased government surveillance and the targeting of KMU labor leaders, Cubelo emphasized that organizers have not stopped fighting back. In addition to helping organize unions and strikes, KMU has also started a workers’ school, Paaralang Crispin Beltran, that offers free courses on subjects such as leadership training, paralegal training, unionism, and know-your-rights training. Mong Palatino’s presentation discussed the rich history of people’s resistance in the Philippines and the current national situation regarding President Duterte’s war on drugs, which has targeted workers and the poor, resulting in an estimated 25,000 to 30,000 extrajudicial killings. Despite the brutal actions of the Duterte government, Palatino emphasized the fact that people from many different labor groups, women’s groups, lawyers’ groups, and international solidarity groups have continued to resist this oppression and fight back. After the presentations, the event closed out with a group discussion. The questions and discussion included topics such as women workers’ conditions and resistance, leadership structure in unions in the Philippines, and what people in the U.S. can do to show support and international solidarity.